I really wanted a rocket ship mobile for Ezra's room. I figured it wold be easy enough to make. I took some pictures along the way, so if anyone wants to make a rocket mobile for themselves or as a gift, it is really easy, and looks soooo cute! Draw your rocket ship template on the piece of paper. If you are horrible at drawing, you could download a picture and print it out. 6. Cut free hand, or use your templates to cut out the wings of the rocket. Cut the fins (this is what Joel told me they were called, blame him if its wrong) for the front and back of the rocket, attach the front as shown in the picture below. Also leave the bottom of the rocket open. Put the fin inside and fold the pieces back together stitching the wing into the body as you stitch both sides together. Do this with both side fins. Once you have attached both fins and tied off the thread at the end, you can now turn your rocket the right way around, and stuff it with the stuffing. Make a template for the flame, and then attach it to some red or orange felt and cut it out. 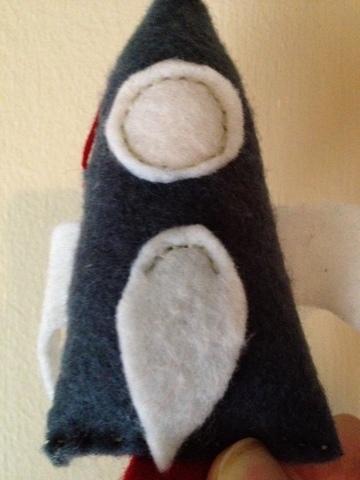 Put the end in between the two sides of the rocket and use a running stitch to seal it all up. And there you have it, a lovely finished rocket ship. I made 7 of these alternating colours. Then I made a moon for the middle. Make a moon shaped template, I did a 1/4 moon but you can do whatever you want. I used a different stitch for this, as demonstrated below. Put the needle through both sides of the moon, then pull the thread through, before it is completely pulled tight, loop the needle back through the loose thread, and put it back in the same side you just inserted it. It gives a nice finished off look, so you don't have to turn the moon inside out. I just stuffed it as I went along, and then finished it up. Now to hang it all. So first cut the amount of thread you need in varying lengths. I used red thread and attached it to the rockets just in front of the side fin. Then use the inside hoop of the embroidery hoop, I used a 8" hoop. You might need an extra pair of hands for this bit. Tie all the threads in a knot at the end, and have someone hold them and the hoop. Tie each thread around the hoop, equal distances apart. Except for the moon let that dangle in the middle shorter than all the rest. It should then look like this. Phew that was long, if you made it all the way here good on you! I am debating making starts for it as well.. we will see. That took a while, I hope you like! 6 comments on "D.I.Y Rocket Ship Nursery Mobile"
Popping by from Freckled Nest! I LOVE this cute DIY! Mobiles are so great for making children's (and adults!) rooms look extra whimsical and special. Great job! This is really adorable! My son's room is outer space themed and this would be a great project for us to make together and hang above his bed (he's 2 1/2). Thanks for the post! this is so lovely! what a great idea! Thanks Wendy, my little boy Loves staring at it!! Such a fun project to make too! !